All transactions are safe and secure with a reliable history in online purchasing behind each of our associates. Buy the Weekend at Barney's t-shirt to own How I Met Your Mother clothing and merchandise. This tee displays a logo for Barney's most far-fetched play from his playbook. 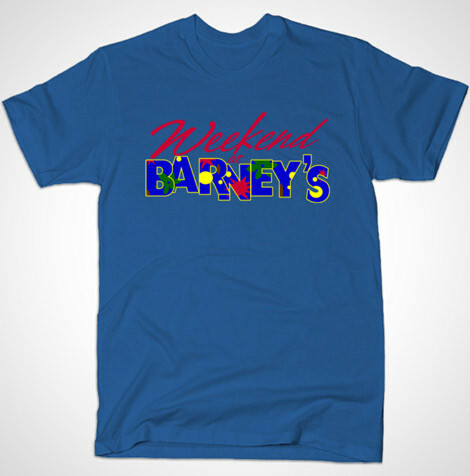 If it wasn't obvious, Weekend at Barney's was inspired by the movie Weekend at Bernie's, where Barney plays the role of Bernie in an attempt to meet women. The design on this How I Met Your Mother shirt is for fans of both Barney and the classic '80s movie. In addition to the Weekend at Barney's tee above, browse the How I Met Your Mother Clothing Gallery for more apparel like men's and women's clothes, kids shirts or hoodies.